Data centers have a high power consumption, which can be more than 100 times the power required for a standard office space. Therefore, it makes absolute sense to devise strategic measures to improve the energy efficiency of data centers. However, cutting costs by making the data centers more energy-efficient should not affect the critical IT demands of the organization. As per U.S. Department of Energy, most data centers have a low energy efficiency of less than 15 percent. Further, the department suggests that the energy consumption can easily be cut down by 20% by adopting some simple energy-saving measures, and if the organization is willing to make some aggressive efforts this cut can be more than 50%. Besides saving on the energy costs, these efficiency measures bring in lots of other advantages like extended life and increased capacity of the existing infrastructure. Rack servers contribute to maximum energy wastage, drawing full power even when their total utilization remains below 20% most of the time. When buying new servers look for the energy star ratings. Those with higher ratings have variable speed fans – where the speed of the fans automatically adjusts according to the load on the server, thus saving energy. For your existing servers you can have a throttle-down device installed which will reduce the power consumption on idle processors. Multi-core processor chips are another way to optimize server energy usage. These provide added performance when compared to single core processors, for the same amount of power consumption. However before implementing any of these, one must consider the potential downfalls — throttle-down devices can lead to slower performance and system failures, and multi-core processors may not work well with high-end graphics and high performance computing. Right sizing and rationalizing storage redundancies should be your next step towards optimizing the power consumption of your data center. One way to reduce storage and CPU requirements on the servers is to transfer superfluous data, which is not needed readily, to offline storage. This can be done by consolidating the storage devices into NAS or SAN. There’s also likely to be a lot of data that cannot be taken offline; thin provisioning can be used to optimize the storage of such data. In this, the users get shared storage as and when they need it from a common storage pool. Virtualization — the technique that allows using several virtual operating systems using a single computer — can help cut down the number of servers required. Virtualization will not just reduce the power required for running the servers, but will also cut down the number and size of cooling units for the server space. 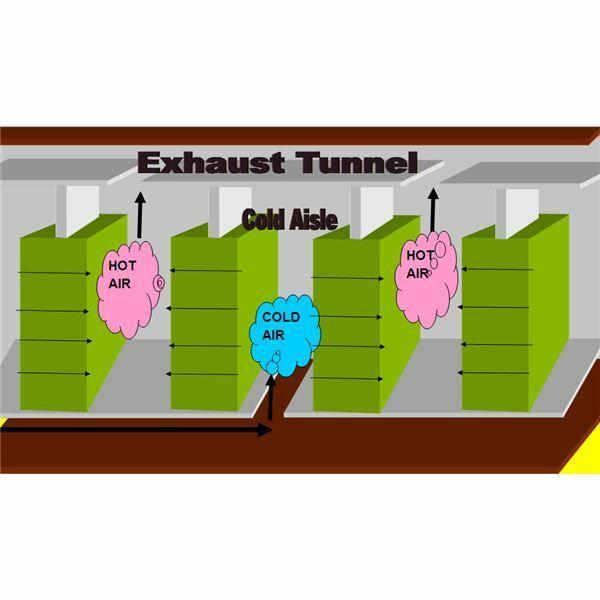 Properly managed airflow in a data center can significantly reduce the power requirements for cooling. Hot and cold aisle configuration is one of the basic techniques used for airflow management. This involves designing the data center space in such a way that hot air from the rack exhausts and the cool air supply do not mix with each other. Here’s an image to demonstrate how this system works. Another important aspect here is to ensure that nothing obstructs the air flow, especially congested cables below the raised cooling floor or in the overhead hot air exhaust tunnels. In case of the usual DX air conditioning systems, mostly used by smaller data centers, the ones which come with multiple/variable speed compressors are more energy-efficient. Their efficiency can be further improved upon by installing water spray devices to cool down the condenser coils. Having an air conditioning unit with an air-side economizer is another energy-efficient option for cooling; however, its efficiency is subject to the climatic zone in which the data center is located. In some data centers, something as simple as relocating the hardware can help bring down the power consumption of cooling equipment. The idea is to increase the cooling efficiency by relocating equipment that have similar temperature and heat load densities together. Opting for customized central air handlers, offers great energy savings when compared to the traditional distributed unit system. Having a low-pressure drop air design helps reduce the energy consumption of the fans. Two things are needed for a low pressure design – keep the under floor and overhead ducts as wide as possible and keep their length as short as possible. Use central water-cooled chillers, with part-load efficiency, and for added energy savings consider raising the evaporator temperature and lowering the entering temperature. Asset Efficiency = IT Energy Efficiency X IT Utilization. Despite several deficiencies, CADE remains the most popular efficiency measurement tool for data centers. These are just a few things that can be done to bring down the power consumption of data centers, to learn more we’d suggest you to visit the US Department of Energy’s website, the link to which can be found in the references section below.